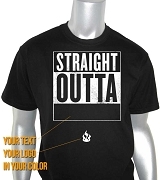 We'll add everything you want, then send it back to you fully customized. Final price will be shown in your shopping cart. What type of item are you sending us to customize? I understand that in the rare event my item gets damaged, it will be replaced with an equivalent that may or may not be the same brand. Under no circumstances will I receive monetary reimbursement. Already have an item and want to add embroidery to it? No problem! You're in the right place. Fill out this form to tell us what you want to add to your item. Complete the checkout process to pay for the additions. Print out your receipt and put it in a box with your item. We'll handle it from there. 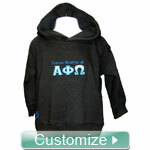 Once we get your item, we'll design a proof for your custom order and email it to you for your approval. We won't stitch anything on your item until we get your final approval on the design. 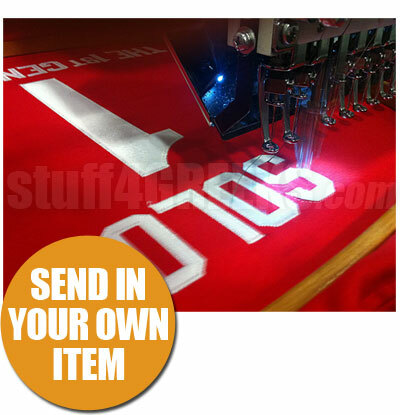 When we're done embroidering, we'll ship your completed item back to you. The whole process is easy and painless! Disclaimer - By placing this order, you agree to the following: I understand that great care will be provided to the item(s) I am submitting to be customized. However, I understand that in the course of customizing my item that it could be damaged. In the rare event that this happens, S4G reserves the right to repair or replace the item with an equivalent item provided by one of their vendors or a local retail store. Under no circumstances will they provide a monetary reimbursement. 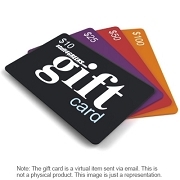 You will earn at least 0 rewards points for this purchase. Your total rewards points will be higher based on the options and quantities that you choose. Your merchandise total at checkout is your true rewards value.